The EU-Region is full of great artists, we want to show them off! This evening we’re presenting Tim Daemen’s unconventional quartet Dada Bölüm and European sax maestro Toon Roos. 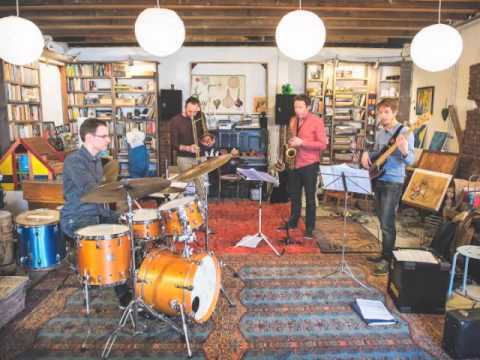 Dada Bölüm is an unconventional quartet lead by Tim Daemen joined by Lennert Baerts, TBD, and Achim Bill. Anchored in the jazz of the 50s and 60s the quartet revels in spontaneous contrapuntal communication with a sense of relaxed freedom. With a successful debut album under their belts, Dada Bölüm weaves together a range of swirling styles into a seamless jumble, the result is intelligent, West Coast jazz with a catchy modern flair. Often acclaimed as one of the best sax players in Europe, Toon Roos’s lyrical style and intuitive musicality has lead to a storied career for the Dutch artist. He’s performed and recorded with the likes of Peter Erskine, John Scofield, and Toots Thielemans in everywhere from the Hammersmith Appollo to North Sea Jazz. He’ll be joined by Karel Boehlee and Sal la Rocca. Together they create modern, lyrical jazz in combination with classics by composers like Miles Davis and Tom Jobim.